DFW Area Office Depot Teacher Appreciation 8/18! 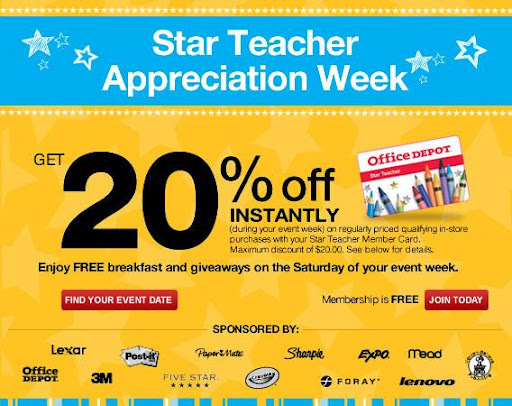 DFW Area Office Depot Teacher Appreciation Event August 12-18! You will recieve 20% off all regularly priced qalifying in-store purchases this week with your Star Member Card. Free Breakfast and Giveaways 9am-11am, Saturday, August 18th in-store! Sign up for your FREE Star Teacher Member Card HERE! Previous postADD/ADHD Medication Savings & Newsletter!